I'll admit I hadn't heard of Hangzhou before I went, and it ended up becoming one of my favorite places I visited in China. 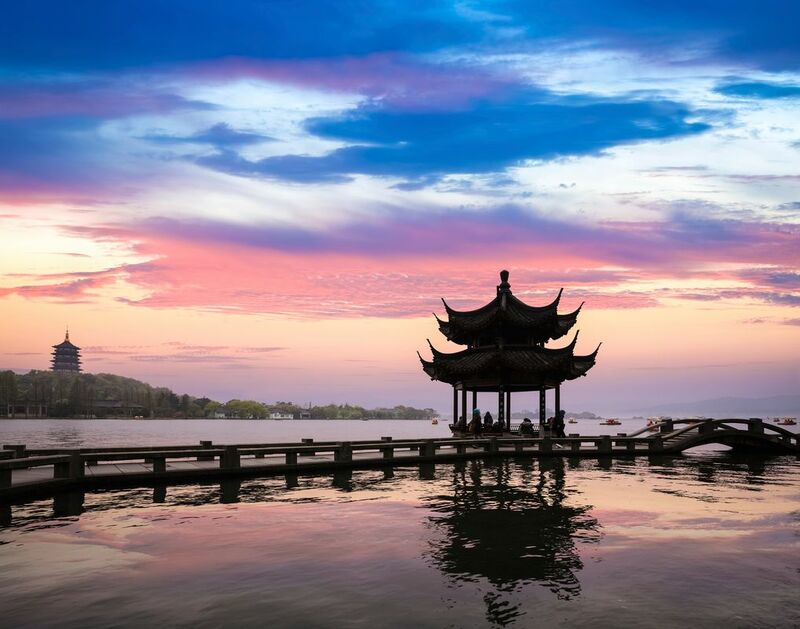 The lake is peaceful and beautiful, the culture and history fascinating, and it's an easy day trip from nearby Shanghai. Worth it even if you can't swing an overnight stay. I feel it is a little bit overrated. Although the lake was very beautiful, it was maybe the only place that was special. I feel there are better places to go to in China. What a beautiful and interesting place in Hangzhou. The popular places are Qiantangjiang ,Xihu and many bridges. Beautiful sightseeing! Amazing Lake views. And awesome show at night: don't miss it! Often visited as a day trip from Shanghai, the city of Hangzhou makes a fine alternative base for exploring the area. At the center of the city is the West Lake (Xi Hu), an enormous collection of gardens, bridges, and pavilions that's as lovely as anything China has to offer. Outside of the lake area (which is quite large, but can be circumambulated in a few hours) there's not a whole lot to see, but one can happily spend several days strolling and exploring lakeside and the hills that surround it, enjoying what is arguably China's prettiest urban landscape. Dubbed “heaven on earth” in numerous Chinese poems, the history of Hangzhou spans back over 2,000 years. It came to global attention once the Beijing-Hangzhou Grand Canal — the world’s longest canal — was built. However, it is West Lake and Meiijawu Tea Cultural Village that are most alluring in present day. Experience the local process of making tea in China by visiting the tea farmlands of Hangzhou. Only an hour away from Shanghai, it’s where you can cruise the peaceful West Lake - a UNESCO world heritage site - and stroll through idyllic tea plantations and buy fresh tea right from the source. The most pleasant city I've ever visited in China. Believe it or not, It is actually livable. Home to some of China's wealthiest business people, the infrastructure here is especially good and this city strikes a comparatively good balance between urban and green. Hangzhou is most beautiful city in China. Grand cansl is new sight-seeing spot. There are lot of traditional hangzhou style shops, restaurants, museums. It's probably one of the most romantic cities in China. You can easily fell in love here...At least I did!